Banks SC, Skerrat LF and Taylor AC (2002). Female dispersal and related-ness structure in common wombats Vombatus ursinus. Journal of Zoology 256, 389-99. Barboza PS, Hume ID, Beal AM and Dawson TJ (1985). 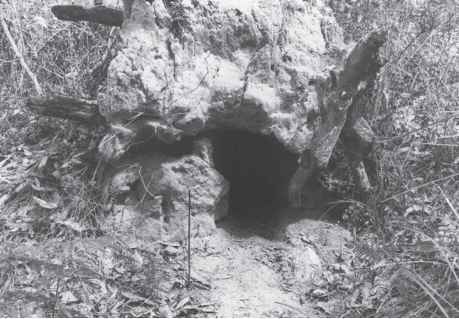 Digestion and digesta passage in the common wombat (Vombatus ursinus). Abstract. Australian Mammal Society Bulletin 9, 49. Barboza PS and Hume ID (1992). Digestive tract morphology and digestion in the wombats (Marsupialia: Vombatidae). Journal of Comparative Physiology B 162, 552-60. Brown G and Young G (1982). Wombats - amiable native lawnmowers. Australian Natural History 20, 279-83. Conder P (1970). Breeding of common wombat in captivity. Victorian Naturalist 87, 322. CSIRO Film Unit (1965). Birth of the Red Kangaroo. CSIRO, Melbourne. Gowland PN (1973). Aspects of the digestive physiology of the common wombat Vombatus ursinus (Shaw, 1800). Honours Zoology thesis. Australian National University, Canberra. Horsup AB and Davidson C (1994). Recovery Plan for the Northern Hairy -nosed Wombat, Lasiorhinus krefftii. 2nd edn. Report to Australian Nature Conservation Agency. Hume ID (1982). The digestive physiology of marsupials. Comparative Biochemistry and Physiology 71A, 1-10. Hume ID (1982). Digestive Physiology and Nutrition of Marsupials. Cambridge University Press, Cambridge. Marks CA (1989). An observation of courtship and mating in the free-ranging common wombat (Vombatus ursinus). In Wombats. (Eds RT Wells and PA Pridmore) pp. 125-8. Surrey Beatty and Sons, Chipping Norton. Minchin AK (1937). Notes on the weaning of a young koala (Phascolarctos cinereus). Records of the South Australian Museum 6, 1-3. Molina K and Sanson G (1982). Molar morphology and occlusion in Vomba-tus ursinus. Abstract. Australian Mammal Society Bulletin 7 (2), 34. Peters OG and Rose RW (1979). The oestrous cycle and basal body temperature in the common wombat (Vombatus ursinus). Journal of Reproduction and Fertility 57, 453-60. Peterson RT (1966). The Mammals of Eastern Canada. Oxford University Press, Toronto. Presidente PJA (1982). Common wombat Vombatus ursinus; maintenance in captivity, blood values, infectious and parasitic diseases. In The Management of Australian Mammals in Captivity. (Ed. DD Evans) pp. 133-43. Zoological Board of Victoria, Melbourne. Taggart DA, Finlayson GR, Shimmin G, Gover C, Dibben R, White CR, Steele V and Temple-Smith PD (2007). Growth and development of the southern hairy-nosed wombat, Lasiorhinus latifrons (Vombatidae). Australian Journal of Zoology 55 (5), 309-16. Taylor RJ (1993). Observations on the behaviour and ecology of the common wombat Vombatus ursinus in northeast Tasmania. Australian Mammalogy 16 (1), 1-7. Waser PM and Jones WT (1983). Natal philopatry among solitary mammals. Quarterly Review of Biology 58, 355-90. Wünschmann A (1970). Die Plumpbeutler (Vombatidae). A Ziemsen Verlag, Wittenberg Lutherstadt.